A revolutionary product that renovates floor finish and restores floors to maximum gloss... like magic! Now it is available in a convenient, Ready-to-use package that is easy to use, easy to store. 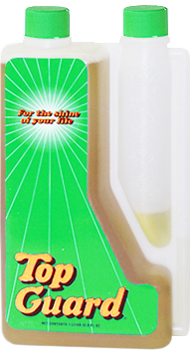 No complicated mixing or dilution required, the perfect concentration every time. Specifically selected polishing agents and cleaners help to remove scratches and scuffs from floors while rejuvenating the floor to a brilliant lustre. Saves labor and extends scrub/strip cycles. 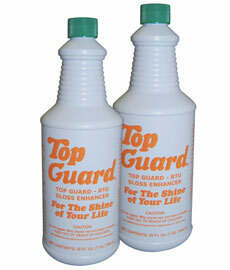 A must for every high speeds/UHS Burnishing Floor Care program! The buffing or polishing of floors can release microscopic particles of styrene into the air, presenting a health risk for all building occupants. 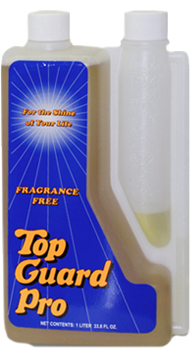 Regular use of Top-Guard eliminates the dust and the release of these particles into the air reducing indoor air pollution.